Promo period is from March 4, 2017 – April 5, 2017. Input his / her valid AirAsia BIG Member ID upon checkout on ZALORA. The said voucher code “AABZ5” entitles the AirAsia BIG member to 20% discount for a minimum spend of Php 2,500 on ZALORA in single purchase. The said voucher code is subject to Terms and Conditions detailed in Item #11. Select Payment Method (Cash on Delivery, or Credit/Debit Card and add card information). Click ORDER NOW to finalize the order. One (1) winner of a round trip airfare ticket for one (1) person from Manila to Boracay (via Caticlan or Kalibo) via Philippines AirAsia. The abovementioned prizes are subject to Terms and Conditions detailed in Item # 12. All orders following the above mechanics must be valid and complete ZALORA orders. Cancelled, returned, and fully refunded ZALORA orders will be disqualified. AirAsia BIG member must input his / her valid and correct AirAsia BIG ID upon checkout on ZALORA. Failure to input a valid AirAsia BIG Member ID will disqualify the entry. ZALORA orders with invalid AirAsia BIG Member IDs will also be disqualified. (Participants may sign up for an AirAsia BIG account at www.airasiabig.com). A participant can only win once. If the name is drawn more than once, winner will get the prize with the higher value. Deadline to earn raffle entry/entries for a chance to win the prize is until 11:59 PM of April 5, 2017. Raffle draw will be held on April 10, 2017 at 4:00 PM at the ZALORA Philippines head office at Level 2, Building B7, Bonifacio High Street, Bonifacio Global City, Taguig City with the presence of representatives from Department of Trade and Industry (DTI), AirAsia BIG Philippines and ZALORA Philippines. ZALORA Philippines and AirAsia BIG Philippines reserve the right, in concurrence with Department of Trade and Industry (DTI), to reject a participant if he / she is unable to satisfy the conditions set out in these promo mechanics. Raffle draw winners will be notified ZALORA Philippines through registered mail, email, and phone call. The ZALORA voucher code “AABZ5” is applicable to participating brands except for brands and categories found on www.zalora.com.ph/faq-non-sale/. i. 25,000 Air Asia BIG Points & Fulfillment Conditions. 2. At the time of fulfillment of 25,000 AirAsia BIG Points, the winner must fulfill all promotional conditions otherwise they will be disqualified from participating or receiving the 25,000 AirAsia BIG Points under this Promotion. 3. The 25,000 AirAsia BIG Points cannot be exchanged for cash or credit. ZALORA and AirAsia BIG Loyalty Programme will not entertain any request from the winner to give or credit the AirAsia BIG Points to a third party’s AirAsia BIG account. 4. Any query and/or dispute on the usage of the AirAsia BIG Points must be directed to, and resolved directly with AirAsia BIG. 5. The validity of the 25,000 AirAsia BIG Points is for a period of thirty six (36) months from the date of depositing the 25,000 AirAsia BIG Points into the winner’s AirAsia BIG SHOT Account. 8. AirAsia reserves the right to revise, amend, or modify the amount of BIG Points required to redeem Award Flight. 9. Once a Redeemed Flight is booked using BIG Points, it may not be cancelled or change name prior to scheduled departure. 10. BIG Points are eligible for redemption only for flights operated and marketed by AirAsia. 11. AirAsia BIG Loyalty Members are responsible for all taxes and fees applicable to Redeemed Flights, including without limitation: Airport or Passenger Facility Charges, Service Fees, Convenience Fees, and other taxes and fees. All taxes and fees must be paid at the time of purchase. 13. In the case of any dispute relating to Redeemed Flights, BIG member must make report at http://www.airasiabig.com. 14. The Redeemed Flight is subject to AirAsia’s Terms and Conditions of Carriage. 1. The complimentary flight award entitles the bearer to one (1) round trip airfare ticket (in one booking) from Manila to Boracay (via Caticlan or Kalibo) via Philippine Air Asia worth P17,000. 2. The complimentary flight award is inclusive of all mandatory charges, including airport taxes, fuel surcharges, admin fees and 20kg checked-in baggage per person only but is exclusive of Airport Terminal Fee, ASF and International Travel Tax when applicable. 3. The travel period is valid for one year upon winner’s receipt of notification / travel voucher except embargo period, long weekends, Holy Week, Christmas and New Year. 4. The prize is not re-sellable but may be utilized by your family and/or friends subject to the Terms and Conditions stated in the complimentary flight award letter. 6. Philippines AirAsia is not liable to you for any loss and/or damages of travel voucher and it will not be replaced. 7. Philippines AirAsia may require proof of identity of the holder but nothing herein obliges Philippines AirAsia under any circumstances to enquire, ascertain or investigate the identity of any person. 8. Each seat shall be for the sector(s) stated. Request to change sector will not be entertained. 9. Except stated herein, this voucher is not exchangeable for cash or any other benefits in kind. 10. This voucher can only be used once. Any seat(s) and / or sector not redeemed within the validity period of the voucher shall be deemed surrendered. 11. Philippines AirAsia is not responsible for and will not replace this voucher if lost, stolen or damaged. 12. All booking of seats is subject to availability but this voucher shall not be used to redeem seats on flights during long weekends, eve of public holidays and public holidays at any time. Itinerary will be sent a day prior to the flight. 13. Booking of seats are only accepted on delivery to Philippines AirAsia with the production of the original Complimentary Flight Award Letter unless stated otherwise. 15. Philippines AirAsia entitled to change any sector(s) by written notification to the holder, who is deemed notified at the time of sent notification. By participating in the raffle, the winners agree to cooperate and participate in any advertising or publicity activities of ZALORA Philippines and AirAsia BIG Philippines relating to the draw. 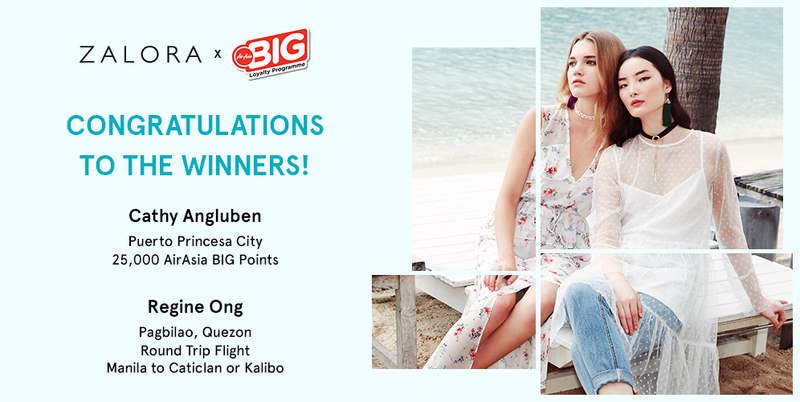 The winners agree that ZALORA Philippines and AirAsia BIG Philippines may publicize the name and photograph of the winners in such mode and manner as ZALORA Philippines and AirAsia BIG Philippines consider fit. Winners’ names and photographs may also be publicized in such mode and manners as ZALORA Philippines and AirAsia BIG Philippines consider fit, such as but not limited to, ZALORA Philippines’ Facebook (https://www.facebook.com/ZaloraPH), Instagram (https://www.instagram.com/zaloraph), and Twitter (https://twitter.com/zaloraph); and AirAsia BIG Philippines Facebook (https://www.facebook.com/airasiabigphilippines/). The links provided are not exhaustive and there may be other publicity channels. Prizes not claimed after sixty (60) days from receipt of notification will be forfeited in favor of Zalora upon approval of DTI. ZALORA Philippines and AirAsia BIG Philippines reserve the right to verify the eligibility of the winning entry. ZALORA Philippines will verify the winner’s order (via the ZALORA website or ZALORA app), whereas the order should be a valid complete order, with no cancellations, returns and refunds. AirAsia BIG Philippines will verify the AirAsia BIG ID account, whereas the said account must exist and must be valid. Employees of ZALORA Philippines and AirAsia BIG Philippines including their relatives up to second degree of consanguinity or affinity are disqualified from joining the promotion. Permit Number 2592 Series of 2017.